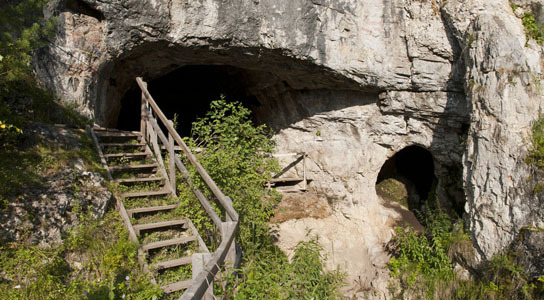 Researchers have now been able to sequence the entire Denisova genome using 10 milligram of a finger bone fragment that was found in the Denisova-Cave in Southern Sibiria. Researchers at the Max Planck Institute for Evolutionary Anthropology have completed the genome sequence of a Denisovan human finger bone that was discovered in Denisova Cave in southern Siberia. Using novel techniques that require using less than 10 milligrams of DNA extracted from the finger bone, the researchers were able to sequence every position in the Denisovan genome about 30 times over. In 2010, Svante Pääbo and his colleagues presented a draft version of the genome from a small fragment of a human finger bone discovered in Denisova Cave in southern Siberia. The DNA sequences showed that this individual came from a previously unknown group of extinct humans that have become known as Denisovans. Together with their sister group the Neandertals, Denisovans are the closest extinct relatives of currently living humans. The Leipzig team has now developed sensitive novel techniques which have allowed them to sequence every position in the Denisovan genome about 30 times over, using DNA extracted from less than 10 milligrams of the finger bone. In the previous draft version published in 2010, each position in the genome was determined, on average, only twice. This level of resolution was sufficient to establish the relationship of Denisovans to Neandertals and present-day humans, but often made it impossible for researchers to study the evolution of specific parts of the genome. The now-completed version of the genome allows even the small differences between the copies of genes that this individual inherited from its mother and father to be distinguished. This Wednesday the Leipzig group makes the entire Denisovan genome sequence available for the scientific community over the internet. “The genome is of very high quality”, says Matthias Meyer, who developed the techniques that made this technical feat possible. “We cover all non-repetitive DNA sequences in the Denisovan genome so many times that it has fewer errors than most genomes from present-day humans that have been determined to date”. The genome represents the first high-coverage, complete genome sequence of an archaic human group – a leap in the study of extinct forms of humans. “We hope that biologists will be able to use this genome to discover genetic changes that were important for the development of modern human culture and technology, and enabled modern humans to leave Africa and rapidly spread around the world, starting around 100,000 years ago” says Pääbo. The genome is also expected to reveal new aspects of the history of Denisovans and Neandertals. The group plans to present a paper describing the genome later this year. “But we want to make it freely available to everybody already now” says Pääbo. “We believe that many scientists will find it useful in their research”. The project is made possible by financing from the Max Planck Society and is part of efforts since almost 30 years by Dr. Pääbo’s group to study ancient DNA. The finger bone was discovered by Professor Anatoly Derevianko and Professor Michail Shunkov from the Russian Academy of Sciences in 2008 during their excavations at Denisova Cave, a unique archaeological site which contains cultural layers indicating that human occupation at the site started up to 280,000 years ago. The finger bone was found in a layer which has been dated to between 50,000 and 30,000 years ago. The genome is available at http://www.eva.mpg.de/denisova and as a Public Data Set via Amazon Web Services (AWS): http://aws.amazon.com/datasets/2357. Be the first to comment on "Researchers Complete Genome Sequence of a Denisovan Human Finger Bone"